Thaxted is a small, pretty, town in north Essex. A railway to Thaxted was first proposed in 1835, but the bill was defeated in parliament in 1836. Although, various railway lines were built within 15 miles of Thaxted, the lack of industry never attracted any other serious proposals for a line to the town. The Light Railways Act of 1896 opened up the possibility of an inexpensive railway joining Thaxted to the mainline at Elsenham, a distance of just over five and a half miles. Sir Walter Gibley, a prominent local landowner, favoured the building of a 2′ 6″ line. He engaged an engineer for the line, Walter Hopkins, who visited the Hunslet works. Hopkins was shown narrow gauge stock and locomotives being built for India. He was impressed and he enthused about the simplicity of the system. 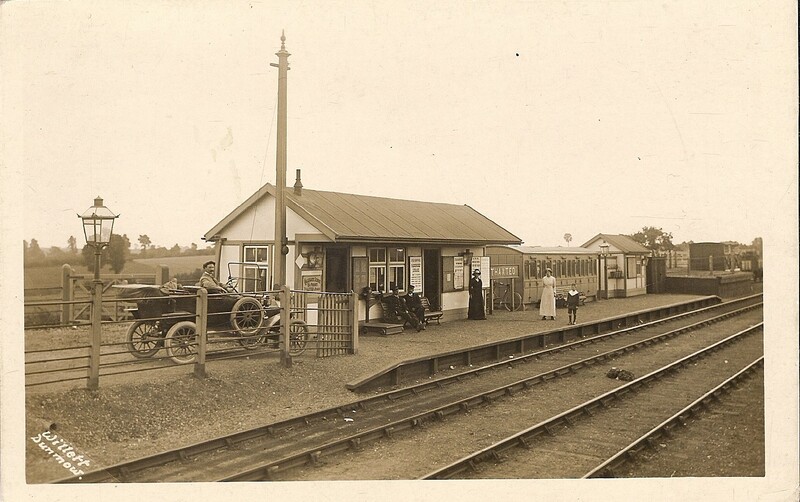 A proposal for a 2′ 6″ line, the Elsenham, Thaxted and Bardfield Light Railway, was submitted in 1896. Fund raising began, and the negotiations with local dignitries, the Great Eastern Railway (GER) and the Treasury continued for several years. Eventually, the GER stepped in and offered to fund half the construction costs and to build and run the railway… if the line was build to standard gauge. This was too good an offer to refuse, and we were robbed of a narrow gauge railway! The standard gauge line was opened in 1913. It was a charming rural line, built at low cost. As with many rural lines it struggled to pay its way. It closed to passengers in 1952, and closed completely in 1953. There are lots of images and maps of the line in the Henham History pages. All the above is true (although heavily summarised). But what if…. the fundraising for the 1896 plan had been successful, and a narrow gauge line, with a slight colonial feel, powered by Hunslets, had been built through this charming part of Essex? If that had happened you would want to model it, wouldn’t you? Well, I know I would ! Image from Wiki Commons, Public Domain. Previous What Will I Model Next ? As Baldrick would say “I have a cunning plan” well it seems you have, the interesting research, the history and so on. Go forth and model.